In my last post, I discussed the Central Park West de-interlining. Continuing with point 1 of my three-point plan to improve the NYC Subway (enhance), I’ll address the B, D, N, Q, and R lines in Brooklyn. [Fig. 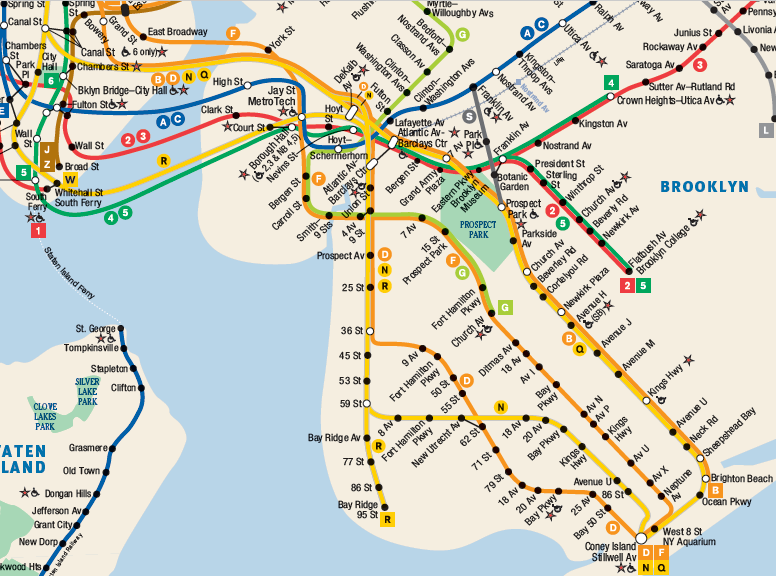 1] Snippet of the NYC Subway map showing the South Brooklyn subway lines and their branches to Manhattan. From the 6th Avenue express tracks, the B and D cross the Manhattan Bridge together on the north side and split in Brooklyn; the B serves the Brighton Line and the D serves the 4th Avenue trunk line. From the Broadway express tracks, the N and Q cross the Manhattan Bridge together on the south side and split in Brooklyn; the N serves the 4th Avenue trunk line and the Q serves the Brighton Line. From the Broadway local tracks, the R enters Brooklyn via the Montague Street tunnel and serves the 4th Avenue trunk line. On the Brighton Line, the B runs express and the Q runs local. On 4th Avenue, the D and N run express and the R runs local. [Fig. 2] Snippet of the NYC Subway track map from vanshnookenraggen showing the complex set of switches and flying junctions north of DeKalb Avenue. This interlocking causes a lot of delays for B, D, N, Q, and R riders in Brooklyn – but it doesn’t have to. That’s where NYTIP comes in. Swap the D and Q lines in Brooklyn. [Fig. 3] D/Q swap, northern segment, via Brand New Subway. [Fig. 4] D/Q swap, southern segment. At DeKalb Avenue, the D/Q swap essentially exchanges direct service to Canal Street and Broadway for direct service to Grand Street and 6th Avenue. The station retains direct service to Broadway via the R line, albeit through a route with many sharp curves. Brighton riders desiring Broadway service can make a cross-platform transfer at DeKalb Avenue for the R, or make the longer transfer at Atlantic Avenue for the N/Q/R. [Fig. 5] Overview of the B/N swap. In this scenario, the B replaces the N as the 4th Avenue express to Coney Island via Sea Beach, and the N replaces the B as the Brighton express to Brighton Beach. The B/N swap also removes conflicts between the Broadway and 6th Avenue lines in Brooklyn. Under this option, DeKalb Avenue essentially becomes an express stop on the Broadway trunk serving N, Q, and R trains; however, it loses direct access to 6th Avenue. At Atlantic Avenue – Barclays Center, Brighton riders desiring 6th Avenue service must make the long transfer; there is no cross-platform opportunity. For planning purposes, NYTIP contemplates the D/Q swap. In my next post, I’ll address the Broadway and Queens Boulevard trunk lines. Until next time!